Want to advance your Swegway experience? 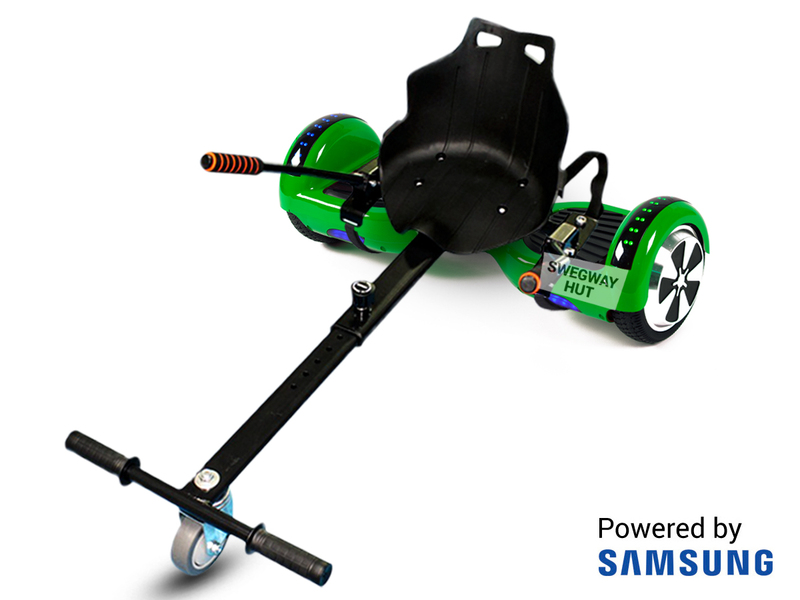 Why not add a Swegway Kart to your Chameleon Swegway Hoverboard, which means enhancing the fun! The Swegway Kart to give you that additional and ultimate experience with your Swegway product! This Awesome contraption converts your Swegway into a Go-Kart and it’s never been easier to use. The Swegway Kart comes a strong and durable plastic bucket seat, a reinforced chassis which holds the weight of the seat and person sat firmly within it. The metal chassis also has a brilliant shock absorbing suspension, so you can go fast, perform tricks and enjoy the Swegway and Swegway Kart to its full capacity. The Swegway Kart is generally easier to ride then just the Swegway alone, with its easy to use sensitive handles/leavers that will allow you full control of your Swegway device. The Swegway Kart is the perfect way to maximise your experience with Swegway’s and provide that smooth ride you have been looking for with your products. Simply adjust the frame to your liking and off you go. This also makes the perfect gift for anyway with a Swegway Device. Furthermore, all our products meet the applicable safety standards (UK) and are all certified and tested before they are shipped out. Not all Swegway kart products will have a black Frame. We will compliment the Kart colour with your Swegway Hoverboard product. Just ordered three boards with Karts from Swegway Hut and I was told it would be with me by the 10th of December, I made my order on the 6th of December and they kept their part of the bargain so it’s only fair I write a good review on the service of the company. The products I have not yet tried but judging from other reviews on here my children won’t be disappointed. The customer support was very good, I called regarding an issue with my Swegway hoverboard and the colour of my Swegway Kart , I believe it was a wire fault but it was sorted within 2 days and someone from the Swegway team called me an hour before informing the new product was on its way and now the board I have works perfectly. All products have been tested and have the correct certifications required to be sold to ensure your safety. You can enjoy Bluetooth connectivity with most of our wicked products. This means you can connect your tablets, phones and music players with Bluetooth to your swegway and party whilst you travel! We are a UK based company and all our hoverboards are stored in the UK warehouses. Stay updated on product releases and promotions. Swegway Hut is driven by ambition and love for the Swegway Hoverboards that we sell. You can see the passion for this within the quality of our products and supreme customer service that we provide. We always make sure we provide you with the best quality Swegway Hoverboards. Furthermore, with our competitive prices, we can guarantee to beat the prices of any other electric balance board provider. We also ensure all of our Swegway balance board product’s meet the applicable safety standards in the UK and are all certified and tested before selling to you! © 2017-18 SWEGWAYHUT. All Rights Reserved. Terms and Conditions apply.